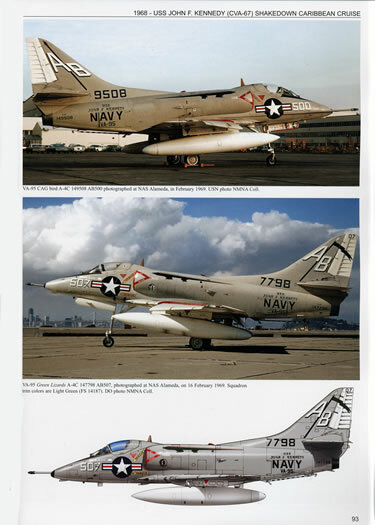 This book is part two of Model Publishing’s coverage of the history of and the aircraft operated by the United States Navy Atlantic Fleet’s Carrier Air Wing One. Our esteemed editor reviewed volume one in February, 2007 and you can read his review here:http://www.hyperscale.com/2007/reviews/books/firstandforemostbookreviewbg_1.htmFor those who are not familiar with the name Model Publishing, they are a European company that is based in Naples, Italy. Their primary focus is pictorial/historical aviation books, CD-ROMs, colour artworks, and squadron prints. Their books are chock-full of sharp clear colour and black and white photos, colour art work (camouflage and markings), and line drawings.As stated above, this is part two of their coverage of CVW-1. If those who of you who purchased the first volume were impressed by the content and layout then you will be equally impressed with part two!This volume follows on from where volume one ended -1957 and it covers a period in which the United States Navy hurriedly expanded to meet the escalating threat of the Russian bear during the “Cold War” era.The volume covers both the new ships that CVW-1 operated from as well as the new aircraft that made up its striking force. 1957 – North Atlantic Cruise Aboard USS Forrestal (CVA-59). 1961 - Med Cruise Aboard USS F.D. Roosevelt (CVA-42). 1961 – OPERATION BLOW TORCH. 1961 – Caribbean Contingency Cruise. 1962 – USS Enterprise (CVAN-65) Shakedown Cruise. 1962 – Joint Chiefs of Staff Orientation Cruise. 1962 -63 – Mediterranean Cruise. 1963 – Haiti Crisis Cruise. 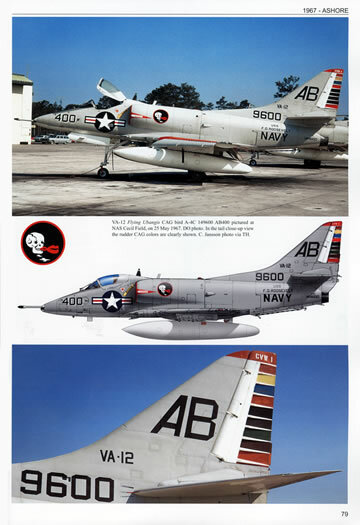 1963 – CVG-1 Redesignated CVW-1. 1966 – A Busy Year. 1966-67 – Vietnam War Cruise. 1968 – USS Pueblo Crisis and Reserve Call-up. 1968 – USS John F. Kennedy Shakedown Caribbean Cruise. 1970-71 - Caribbean, Mediterranean and North Atlantic Cruise. 1971-72 - Mediterranean and North Atlantic Cruise. 1973- Med, North Atlantic Cruise and the Yom Kippur War Crisis. 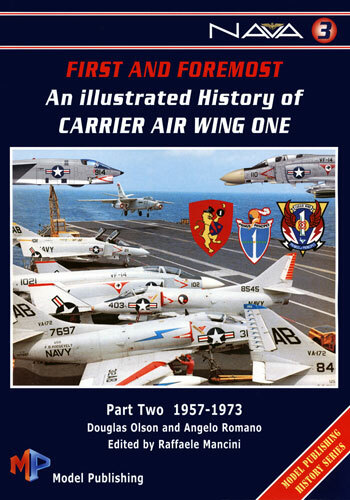 Appendix 1 – Carrier Air Wing One Commanders 1957 – 1973. Appendix 2 – Unit Insignia. The book is soft bound with thin cardboard covers. It comprises 136 A4 size pages with 216 colour and 208 black and white images, 48 colour illustrations (aircraft profiles) as well as 46 unit patches, also in colour.If you are an armchair historian seeking information on US naval operations of that era then you will be well served. The chapters contain a précis of the events of those particular years in an easy reading style. If you are a fan of the gull grey and white colourful unit marking era of the US Navy then you will definitely want to add this volume to your shelves. It is chock full of some truly dazzling images, both colour and black and white. The images are a mixture of official US Navy ones as well as those from private individuals, a lot of them I have not seen before either on the net or in print. I was particularly impressed with the coverage of the A-4 Skyhawk, the photographer(s) have captured this machine very well with both in-action shots as well as excellent close-up shots of the squadron applied markings, which is just what you want if you are trying to source reference pics for your latest masterpiece.I have included images of the front and rear covers of the book in this review, I have also scanned a sample of two of the pages to show the quality of the images. 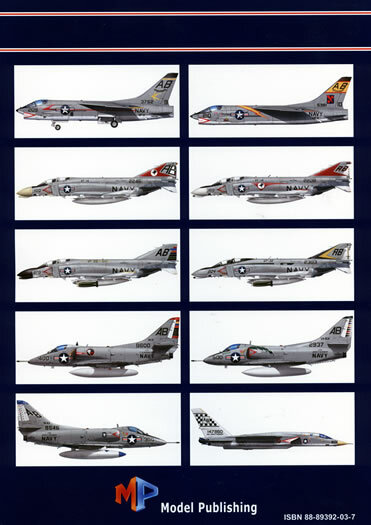 If you need further convincing of the quality of the images visit the Model Publishing website at http://www.aeroslides.com/modelpublishing/book-store.html where they have loaded a further 12 or so sample pages for you to view. As far as I am concerned this is an excellent publication at a reasonable price and it will find a welcome spot in my reference library.